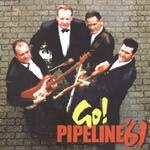 Pipeline '61 have a sound based in the European Shadows tradition, with the tape echoed lead guitar, but they use a crunchier damped rhythm more like a West Coast band, and have a very good drummer and bass player. The resulting sound is both familiar and fresh, with some very cool highlights. Aside from a tight version of the Ventures' "Diamond Head" and their own "Go!," five other instros and nine vocals are all fun in the good for a party sense, and I'd guess they're fun to have at a soiree. The song "Bad Boy" is pretty funny. The Ventures' classic "Driving Guitars" is delivered with damped dry rhythm and warm lead guitar. Very traditional and respectful, with tight drums. This Euro melody track is warm and rich, with a guitar tone between the Shadows and something more aquatic. It's a little on the lightweight side, but good listening. Great rhythm guitar under a vintage rock sound. The structure is fifties with early sixties twang. More a progression than a melody. A very precise version of the Surfaris' "Wipe Out." The trouble is, it was Ron Wilson's liquid playing that made it work, and it's just not here. Otherwise, it's as good as any other. "Black Eyes" is played so slowly, with a fifties sock hop beat and string bending twang. Very nice version. The Ventures' surf masterpiece "Diamond Head" is reverently delivered with delicate damped picking and a tight performance. While it doesn't stand above the 40 or 50 other covers, it's quite well done. This original instro is launched from a Euro sound with requisite string bending and echoed guitar. The melody is quite nice. Drama and energy, and an afternoon cruise feel.